The premium cosmetics retailer has placed design and expert curation at the heart of its business model. Being the face of any company brings with it responsibility. Being the face - and initials - of a company identified with all that is innovative in the worlds of cosmetics and beauty demands an all-consuming commitment, which Nicky Kinnaird, 49, has delivered body and soul for more than 20 years. In contrast to the edge-softening nature of her wares, there is a steely, competitive toughness close to the surface of the Belfast-born entrepreneur, who retains a hands-on involvement in her 86 Space NK stores in the UK and US, always on-message for the next meeting, interview or punishing game of tennis. Her idea of the perfect holiday, she told The Wall Street Journal, is a boot camp. Albeit at the Ranch at Live Oak, Malibu. Kinnaird's interest in fragrances dates back to childhood holidays and the exotic aromas of Spain, while retail has always been in her blood, as demonstrated by her lifelong passion for shopping, and early career as a retail analyst. Her business masterstroke, however, came in 1993, when she identified the need for a retail space where a range of premium-price cosmetics and beauty treatments could be promoted in an upscale environment - the so-called luxury apothecary. Sourcing products from around the world that were then largely unavailable in the UK - Eve Lom, REN - she created Space NK, with an emphasis on expertise in her staff training. Almost overnight, the store was a success and expansion followed rapidly. 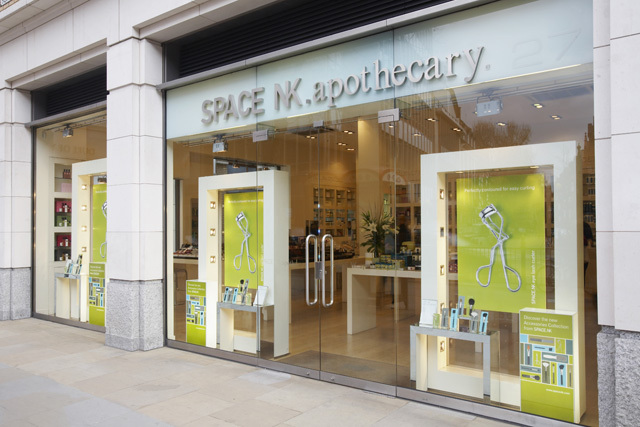 Space NK began as a lifestyle store; originally Kinnaird dealt with more than 300 suppliers. When expansion began in earnest in 1996, she tweaked the concept so that Space NK stores dealt solely in beauty products. This still involved hundreds of suppliers: Kinnaird's philosophy remains that, while every brand has hero products, customers are naturally eclectic and look for what works. An expertise in sourcing the unusual and hard-to-find, combined with an impartiality in the promotion of products, proved instantly attractive to customers. The design of Space NK stores has also been pivotal to the chain's success. Influenced by the clean lines and bright white aesthetic of the European pharmacies that inspired her, Kinnaird has adapted this look with an ultra-modern twist in her stores. While the range might be great, there is a conscious attempt not to overwhelm the customer, emphasising that expertise has already been applied in the edit. Kinnaird, an MBE since 2009, sold a 90% stake in the business to Manzanita Capital for a rumoured eight-figure sum in 2007, but has remained very much Space NK's driving force. A fruitful partnership with QVC in the US has cemented the brand's success there, with Kinnaird expanding her skills to include TV presenting. As she nears 50, Kinnaird shows few signs of taking her foot off the accelerator, describing age as "just a number" and listing her main wish as the expansion of the day to include 26 hours. As a woman who has built her career on slowing down the effects of time, her desire seems somehow appropriate. - Space NK's first store was located in a former banana warehouse in Covent Garden. - Founder Nicky Kinnaird took a degree in land management at Reading University, graduating in 1985, en route to becoming a Chartered Surveyor. Her ability to identify key store sites has been pivotal to the company's success. - Kinnaird wrote the business proposal incorporating the original idea for Space NK during an August bank-holiday weekend trip to Cornwall. - Testing every product (including those designed for men) on her own skin is something that Nicky Kinnaird still practises, enabling her to vouch personally for everything she sells. - 1200 residents of London's Primrose Hill area - including artist and film-maker Sam Taylor-Johnson and actress Sadie Frost - signed a petition in 2012 unsuccessfully protesting against Space NK's plans to open a branch on Regent's Park Road. The brainchild of Millie Kendall, formerly of Ruby & Millie cosmetics, and ex-Vogue beauty editor Anna-Marie Solowij, the Harvey Nichols Beauty Mart, located on the third floor of the Knightsbridge shop, offers the same industry-insider expertise as Space NK, albeit in more intimate surroundings. Established in 2012, it sources products that are otherwise hard to find in the UK (Bioderma is a particular favourite) and the success of its website has not diminished the shopping experience. With 1750 stores in 30 countries, Sephora is a beauty behemoth, but prides itself on still supplying a highly eclectic range of cosmetics. The company was founded in Paris in 1970, and only crossed the Atlantic in 1998, making its debut in New York City shortly after being taken over by luxury retail group LVMH. It quickly embraced some aspects of its new environment (in the city that never sleeps, its Times Square store stays open until midnight), but its lack of hard-sell has endeared it to its US fans. Inspired by buying a tube of moisturiser while hungover at Dublin airport, the Jersey-born, Aussie-raised Feelunique.com co-founder Aaron Chatterley is not the typical beauty guru, but that hasn't prevented him and business partner Richard Schiessl establishing themselves as major players in online beauty retail. Persistence has been the key - it took them four years to persuade Clarins to let them sell its products - but the company and its customers are now reaping the rewards. For such a venerable cosmetics institution (founded 1851), Kiehl's has retained a surprisingly sprightly ability to wrongfoot its competitors with its idiosyncratic marketing strategies, which include lovingly crafted window displays of vintage motorcycles alongside its long-established strategy of copious free samples. Its philanthropic gestures and significant male customer base ensure its cult status in US beauty retail. Having left school at 13 to care for her mother, Jo Malone's creation of a multimillion-pound fragrance company was founded on her incredibly sensitive sense of smell and an unquenchable appetite for hard work. She sold out to Estee Lauder in 1999 and, having overcome breast cancer, now continues to prosper with her Jo Loves website.